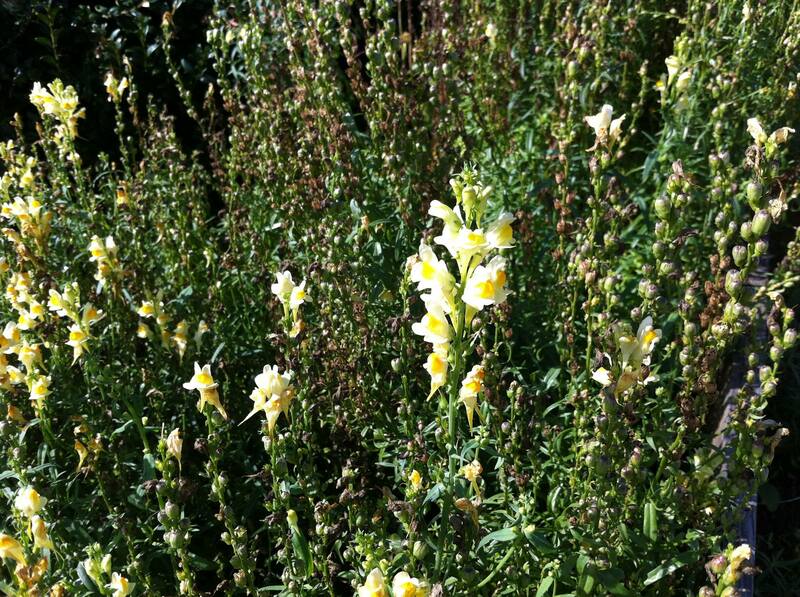 Tackle the scrub advancing onto the small patch of Common toadflax. November’s Volunteer task will be on the first Sunday of the month rather than the normal second Sunday. This is to avoid the clash with Remembrance Sunday. 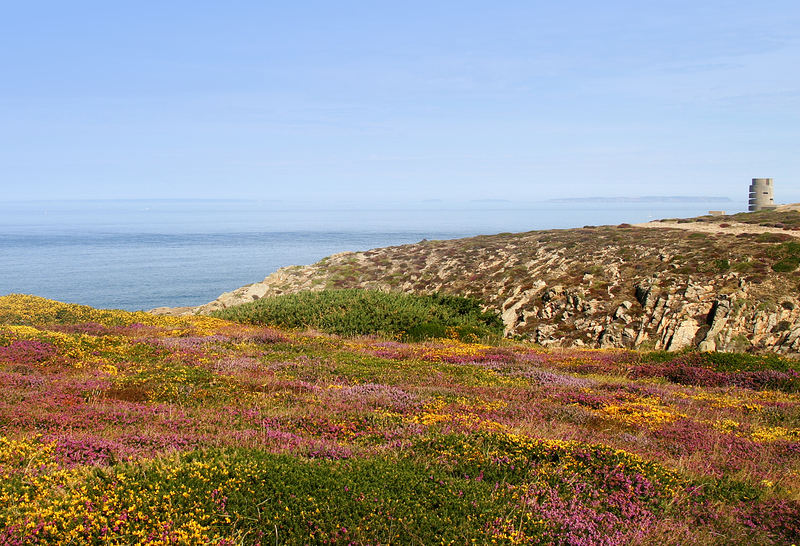 Noirmont Common is a Site of Special Interest on the south-west coast. Our regular volunteers will know it quite well! 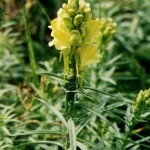 Common toadflax Linaria vulgaris is a Biodiversity Action Plan Species with a ‘locally scarce’ status. 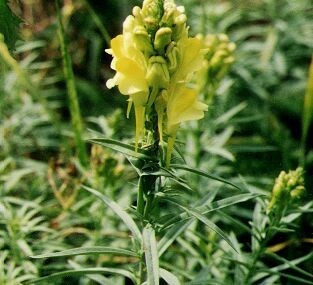 It’s habitat is grassy banks and fields and, therefore, one of the reasons behind this species’ decline in recent years is harsh branchage methods, cutting before the plant has finished flowering, and not removing the cut vegetation. 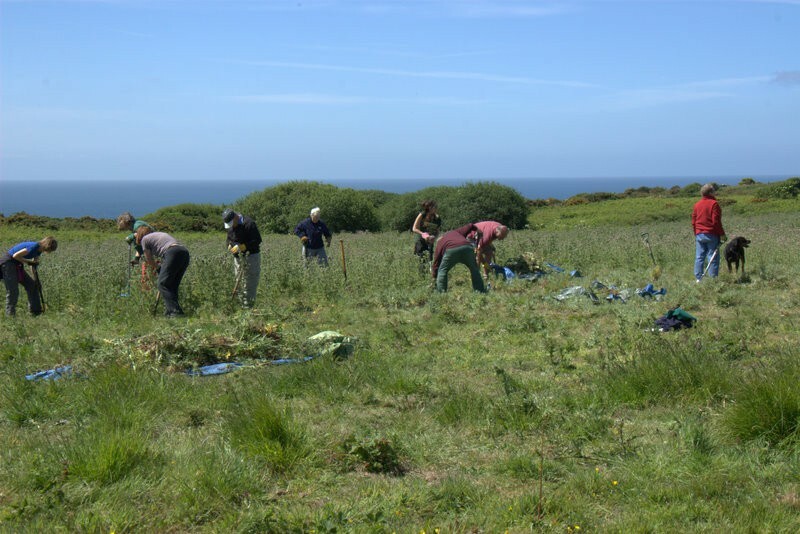 There is a small but thriving area of common toadflax at Noirmont which we are trying to encourage to spread; however, we need to tackle the relentless march of scrub which surrounds the patch and threatens it. As always, some tools will be supplied, but you are welcome to bring your own if you have them. Cutting tools such as sickles, secateurs and loppers will all be useful as well as rakes. Good thick gloves (though again we will supply a pair if you don’t have them), sturdy boots and common sense clothes to cope with the elements are recommended. Kim ‘the cake’ Koester will be on hand to dish out coffee/tea and cake at the end of the task. 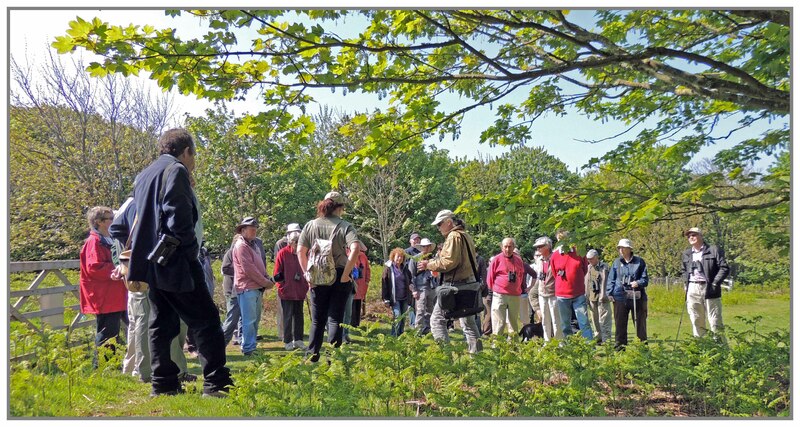 Join Birds On The Edge and The National Trust for Jersey on a tour of this year’s BOTE achievements as we walk along the north coast path from Devil’s Hole to Sorel Point. Following up the very successful Spring Walk, now we have a chance to catch up with the project’s latest news and witness the progress made. We will see the grazing herd of Manx Loaghtan sheep, the bracken clearance works and the conservation fields that are in full bloom to feed our local birds throughout the winter. 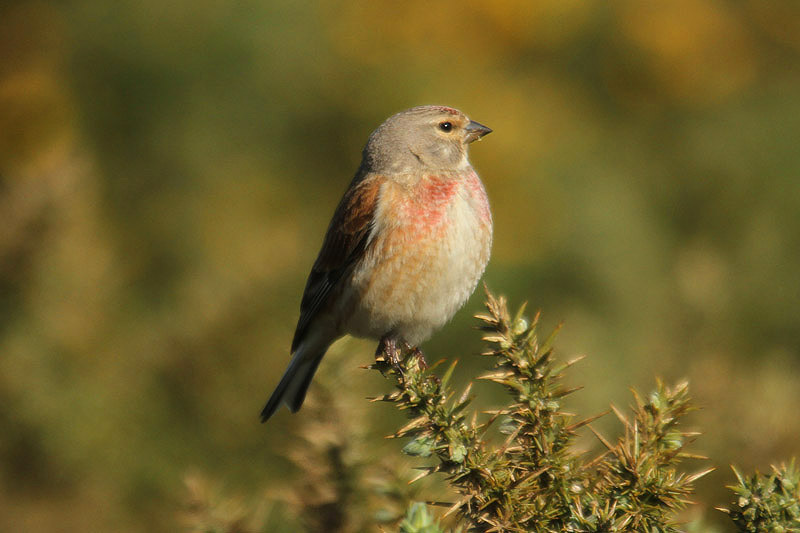 We hope to see the chaffinches, linnets, goldfinches, skylarks and song thrushes amongst other birds feeding in the conservation crops and learn about the findings of the north coast breeding survey that was carried out in the spring. While we are on the cliffs we will look out for the choughs and learn how the programme to return these stunning birds to the Island is progressing. We can see the release aviary and get the latest update. The walk will last approximately two hours, on undulating terrain, so good shoes are required and a degree of fitness. Bring weatherproof clothing and drinks as, you never know, it might be warm! There will be a pub on hand for lunch later if you choose! With the second release at the end of August seeing Green and Mauve flying off to the quarry, September turned out to be a very busy month. 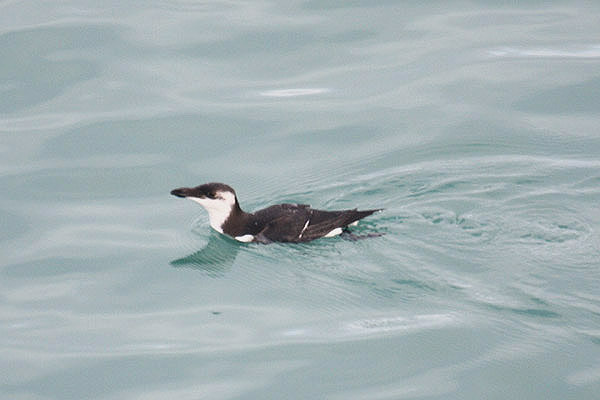 After two days of living around the north edge of the quarry, the pair started to explore the coastline eastwards. The blanket covering of bracken heading off to Bonne Nuit was probably the reason they decided to turn back almost immediately and look for foraging sites around Ronez Point. Potential sites are limited in that area but thanks to their training in the aviary and the continuous monitoring by staff they were able to find food. Using a moveable target board, placed in clear view and on ground where the choughs can land, the birds were lured down for mealworms. Very quickly the pair remembered that on hearing a whistle their keeper would be bringing food. By the second day of supplementary feeding the tracking sessions had turned into feeding sessions with the birds appearing like clockwork. For reasons known only to them, the pair decided to travel west in the afternoon four days after leaving the aviary. They arrived back at the aviary in the late afternoon much to the delight of the rest of the group and the team. 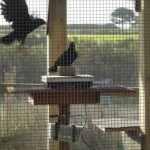 The chough pair didn’t need much encouragement to go back inside the aviary. On cue with whistle and food they flew through the open hatches and joined the others. 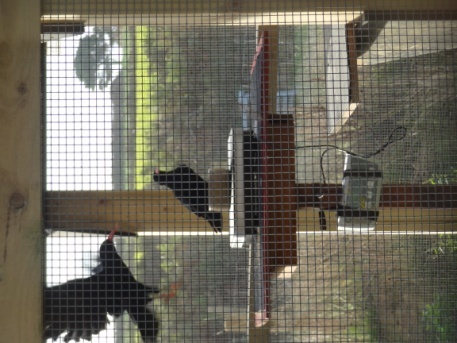 The next morning Liz was able to get weights from all of the choughs landing on the scales. Green and Mauve had lost a bit of weight from being out but nothing alarming. Naturally they would have burned more calories flying around exploring the quarry and food would be limited compared to that available at the aviary. Providing the birds with supplementary insects whilst out, no doubt kept their body weight at an acceptable level. Thick fog led to a few days delay until the next release. This was more eventful than the last due to couple of factors out of the team’s control…weather and uninvited ‘visitors’. All seven choughs ventured outside this time and settled quite happily on the ground in front of the aviary probing for insects. Before it was time to call them back, their attention had been diverted to a flock of 30 carrion crows heading inland from the cliff path. The choughs took to the air with great intrigue and circled with the crows for a few minutes. Curiosity satisfied, the crows departed with the choughs heading towards Mourier Valley. Liz tried to call them back but by this stage they were no doubt overwhelmed. In panic the group began to split up with a pair heading over to Devil’s Hole and one bird flying inland towards the farm. All this was being hampered by the onset of a really heavy downpour forcing the birds to find shelter. By sunset three birds (Green, Mauve, and Red) had returned to the aviary. Interestingly these were the only three that had previous experience of having to find a roost outside of the aviary. An example of learning by trial and error maybe? Visibility in low light and rain meant the remaining four could only be located via their radio signals. Two were thought to be in the adjacent fields to the aviary whilst two others were near the dirt bike track. Upon returning at 06.00 the next day the four were visually located and then followed throughout the day. Very early on Orange, Black, and Blue met up in the quarry. White was also in the quarry but for some reason keeping separate. By the afternoon all four were together foraging around the south side. 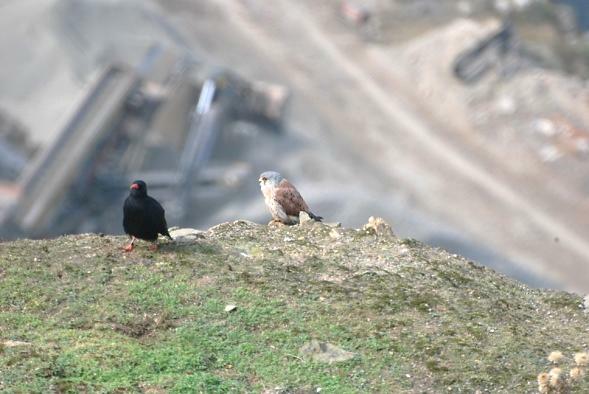 Unlike the pair that had previously spent time in the quarry these four roosted outside on the rock face. In light of previous activity, the plan was to keep the three aviary birds locked in acting as call birds and monitor the four outside under the assumption they would return to the aviary. After six days out there was concern that these birds had different intentions. Attempts were made to supplementary feed, but with location and wind conditions they were not very successful. On the evening of the 12th insects were left out in an area the choughs might naturally forage but had not been seen in before. 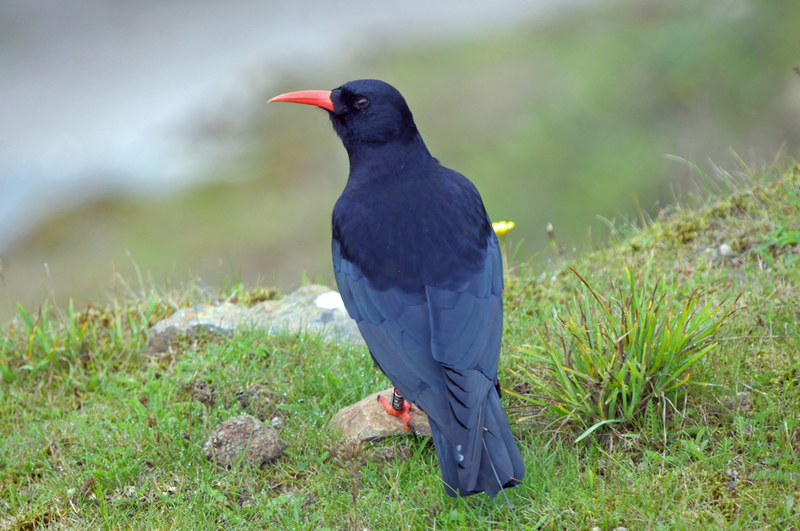 The team were pleased to see the chough there the next morning so the process was repeated. Unfortunately this week appeared to coincide with the departure of summer. 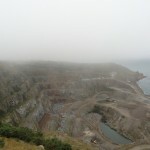 Horizontal winds and rain prevented insects from being thrown into the quarry. This probably also forced the birds to stay in the quarry where they knew they could find shelter. On the 18th radio trackers were picking up a stationary signal from Orange away from the other three choughs. Bad weather the day before meant that simple visuals on all four birds were not possible in the afternoon. 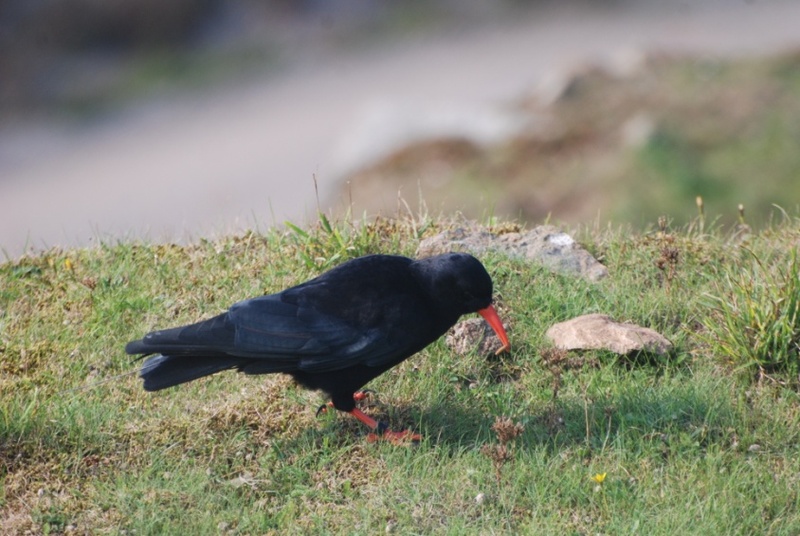 Only two choughs could be seen on the morning of the 18th. The signal from the third implied it was with them, but with lots of hiding places and tall vegetation seeing the colour rings was near impossible. 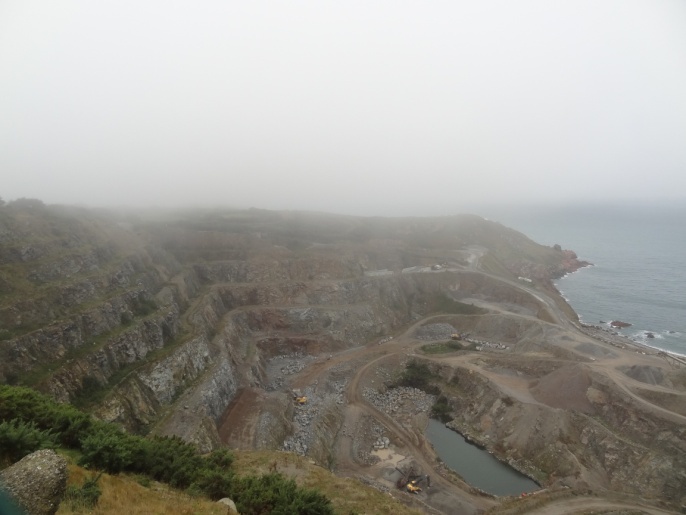 With no change by the afternoon the radio trackers were obviously concerned and approached the management of Ronez Quarry to request permission to search lower levels. Unbeknown to the team, Ronez were trying to contact them at the same time. Sadly workers down on the floor of the quarry had found a recently dead chough and had brought it back up to the offices to return to Durrell. To the surprise of the team the body recovered was that of White and not Orange. 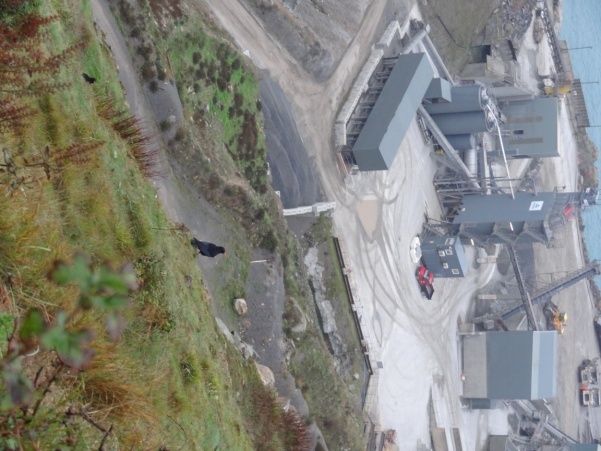 It seems that the movement of White’s signal in the afternoon was a result of her being driven out of the quarry in a company vehicle. The body was taken straight to Durrell’s Veterinary Department where a full post mortem was carried out. The cause of death was recorded as starvation. Although internal parasites were found, it is thought that these were secondary and not the underlying cause of death. 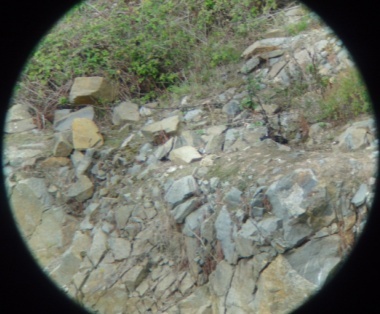 The tracking team was granted permission to enter the quarry under the supervision of Kirsten du Heaume, Operations Manager. Several attempts were made to isolate the signal. 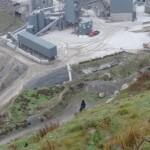 The search was hampered by signal bounce from the granite rock and health and safety concerns which prohibited access to certain levels. Kirsten kindly searched a few areas not usually accessed, but with no success. As frustrating as it is, nothing more could be done. The signal location remained unchanged for a week and with no sighting of a third chough, Orange was disappointingly declared deceased. Blue and Black in the meantime were flying strongly, avoiding the peregrines, and ironically once again taking supplementary feed the day White was found dead. Using a catapult, the insects could be thrown against the wind and reach levels the team could not. 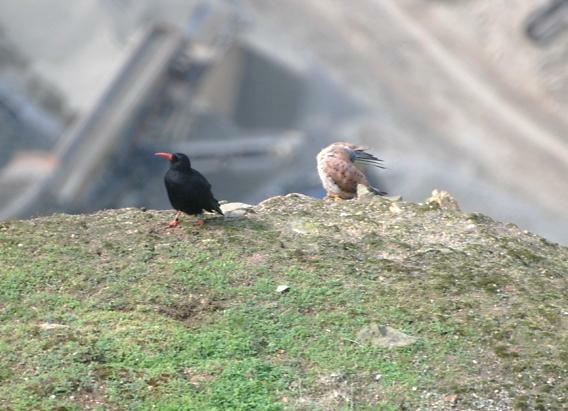 The two female choughs settled into a pattern of flying to the supplementary feeding site when called and appeared to not have any reason to leave the quarry. The release process was restarted on the 23rd with the three in the aviary. If Green and Mauve did return to the quarry they would hopefully meet up with Blue and Black and lead them back to the aviary. Red, now a single female with the loss of Orange, would presumably fly with them in fear of being left behind. This time, however, the birds didn’t leave the aviary field. 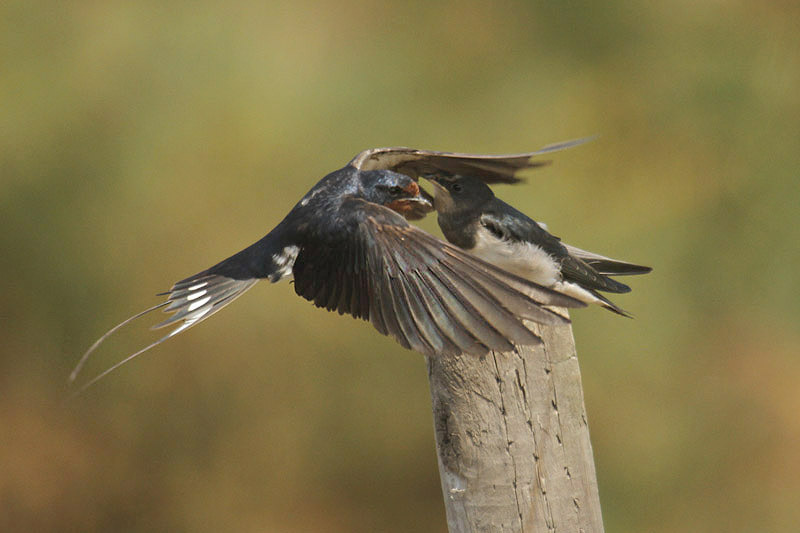 They made several short flights from target sites to perching points along the hedgerow erected by the keeper. Having high places to land near the aviary allowed the birds to feel more secure and take time to assess their surroundings. All three returned on call and were locked in the aviary overnight. The next day was very different. The pair exited the aviary within 53 seconds of the hatches being opened, took to the sky and flew straight back to the quarry. Leaving a rather confused Red behind in the aviary. 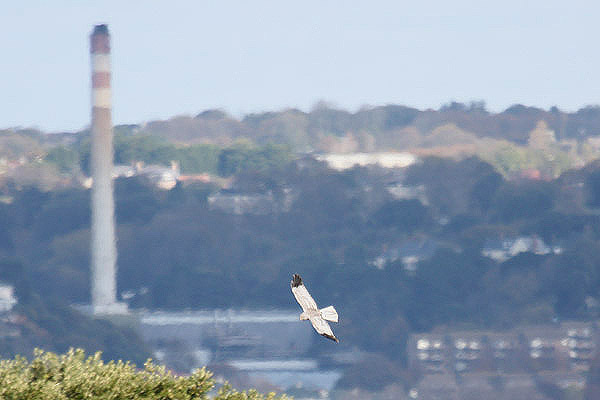 As the pair flew over Ronez Point an attempt was made to call them down for supplementary feed. Blue and Black flew up from the quarry and took to the challenge readily. Green and Mauve flew over calling, but then headed away and over to Sorel point. After feeding, Blue and Black headed back into the quarry. However, for reasons only known to a chough, Blue decided to continue flying and minutes later landed on the roof of the aviary. After 18 nights of roosting in the quarry and to the delight of Red, Blue spent the night in the aviary. At the morning’s weigh-in session, Blue was found to be the same weight as when she first left: once again showing the necessity of supplementary feeding if the birds choose to live in the quarry. As Liz was packing away the scales, Green and Mauve landed on the aviary. Like a well-rehearsed routine, the pair walked back into the aviary where they joined the others. The next release, on the 26th, was somewhat more predictable with the exception of the gunshots coming from the fields inland. Each time a shot was fired the birds would fly up from the ground to a perch and/or shelf. At the same time that the decision was made to call the birds back before they got too upset, the pair decided it was time to leave. 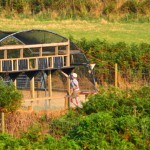 They circled the aviary a couple of times before heading straight back to the quarry. Despite their calls being audible to onlookers neither Black nor the pair made an attempt to meet up. 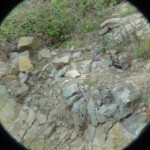 By the end of the month Black had settled into her routine of meeting the team for food and roosting on the quarry face. Green and Mauve happily roost in the quarry buildings, but return to the aviary for food. Blue and Red appear nonplussed by the absence of the others and continue as normal in the aviary. The number of wild birds in the UK is still falling, despite efforts to protect them by changing farming practices. 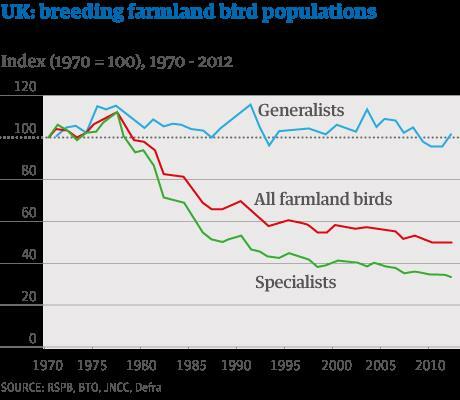 Since 2003, there has been a 13% decline in the population of farmland birds. In the five years to the end of 2012, the decline was 8% overall. The decline has slowed, according to the Wild Bird Indicator statistics released by the UK Government, and some species are in better health than they were in the 1970s when data began to be comprehensively collected. However, conservationists are concerned that the drop in numbers is continuing, with a halving of farmland bird numbers in the past 40 years. Woodland birds are down 17%. Turtle doves have had their lowest level of sightings since records began. Lapwings are down by nearly two thirds since 1970, while corn buntings are down nine-tenths in the same period, and the number of skylarks is down by well over half. Farmland birds suffer from intensive agriculture, as farmers often remove or drastically cut back the hedges and trees where many of them live, while pesticides can leave them with less prey, and a lack of wild field margins cuts down on habitats. There are some government-sponsored schemes to encourage farmers to make room for wildlife, for instance by leaving field margins wild, cutting down on pesticide and artificial fertiliser use, and leaving some areas fallow or pasture. There are also strict laws against killing rare birds of prey, but conservationists think these are frequently flouted. Under reforms to the common agricultural policy, which were agreed this summer, the UK Government has the ability to divert some of the millions of pounds of funds available – which come ultimately from European taxpayers – to environmental stewardship schemes to reward farmers for good practice. The UK Government, has still not said how they might allocate the funding, which could go up to 15% of the agricultural subsidies budget. But given the government’s freedom of action under the new rules, much of it could go to farmers based not on their practices but on the amount of land they farm, as other subsidies are. A decision is expected before the end of the year, and green groups are concerned that the amount devoted to environmental measures will not be enough to halt further declines in wildlife numbers. 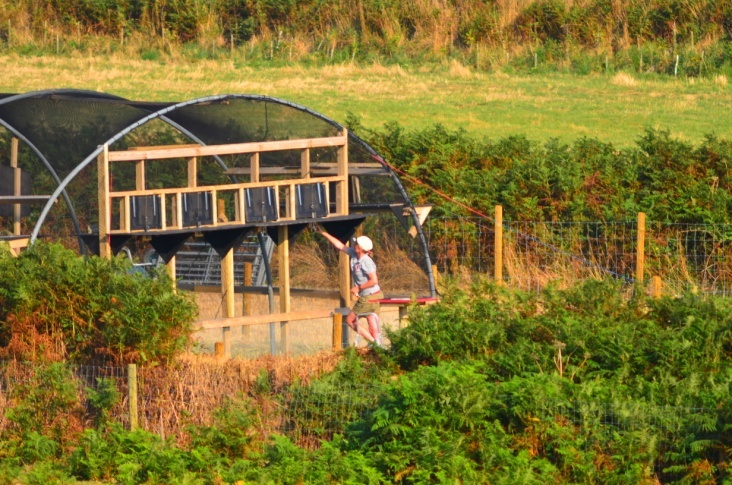 The situation in Jersey appears very similar and Birds On The Edge is working with our local farmers to monitor locally endangered birds and enhance the habitats of their farmland via a sponsored trial scheme. Some of the fields in the north coast have been planted with hedges and the fields have been sown with conservation crops that are providing birds with a source of food throughout the winter. 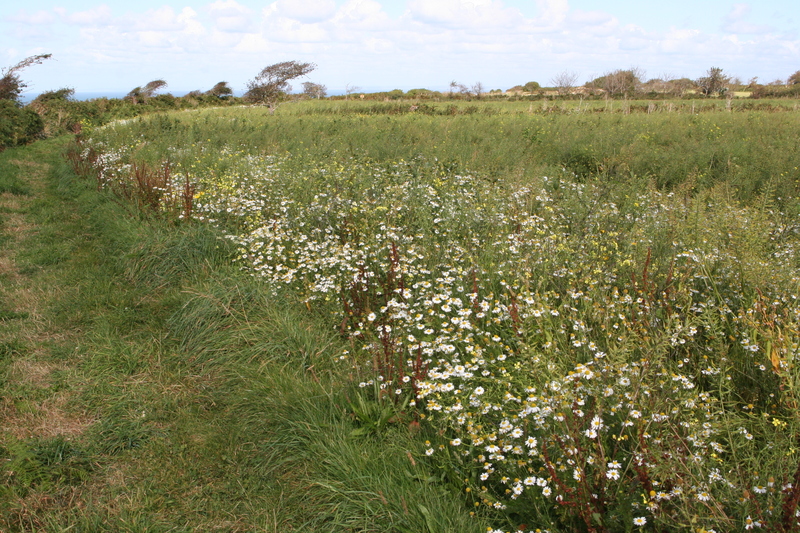 The public will hopefully be able to see these fields and the birds feeding on them on the Birds On The Edge Autumn Walk – details to be announced soon. PIB discharge at sea BANNED! 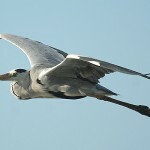 Following action by The Wildlife Trusts, RSPB and RSPCA the International Maritime Organisation (IMO) decided to reclassify Polyisobutelene (PIB), under the International Convention for the Prevention of Pollution from Ships (MARPOL), making it illegal to discharge any amount into the sea. The IMO is stopping ships from discharging PIB at sea after birds covered in the sticky substance were washed up on the Channel coastline. Over 4,000 seabirds washed ashore, dead or dying between February and May, after there were two separate spills. The substance which has been likened to PVA glue in consistency, coats the birds feathers, rendering them unable to fly or maintain core body temperature. The tragedy, the largest marine pollution incident of its kind in the region since Torrey Canyon, shocked thousands of people. At a meeting of the IMO’s working group on the Evaluation of Safety and Pollution Hazards of Chemicals (ESPH), it was decided to change the classification of high viscosity PIBs and prohibit any discharge at sea from 2014. This will also apply to new “highly-reactive” forms of PIB, which are currently being transported un-assessed. The recommendation to do this had been made by the Maritime and Coastguard Agency (MCA) on behalf of the UK Government, following vigorous campaigning by wildlife charities and the public. This was a decision which was expected to take years and the efforts of all those who lobbied so hard in the Channel Islands should not be forgotten. Thanks go out to GSPCA, JSPCA, Durrell, La Société Guernesiaise, La Société Jersiaise and the National Trust for Jersey who joined the AWT campaign and all of their Facebook and Twitter followers! 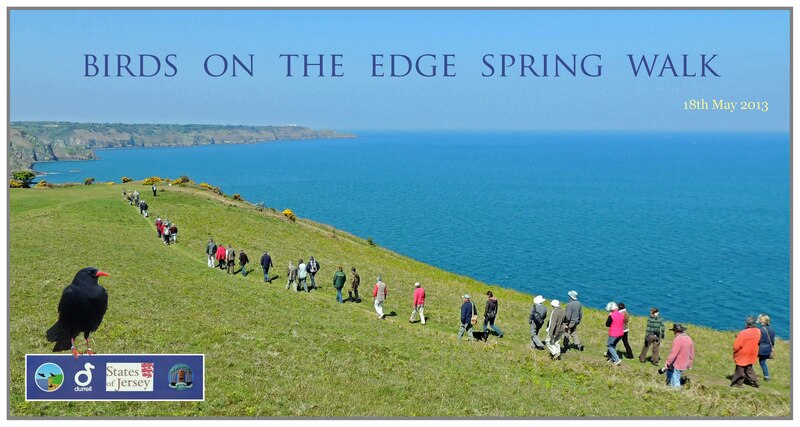 The Birds On The Edge report can be read here. Today’s decision is a real step forward, safeguarding our seas and sealife for future generations. How many birds die each year in human-related ways? It is becoming increasingly obvious that our already declining bird populations, threatened by widescale habitat and climate changes, are put under further pressure through the actions of humans. Scientists with Environment Canada have found that human-related activities destroy roughly 269 million birds and 2 million bird nests in Canada each year. Most human-related bird deaths (about 99%) are caused by impacts of feral and pet cats, and collisions with buildings, vehicles, and electricity transmission and distribution lines. Over the last four years, 20 Canadian scientists conducted extensive analyses that enabled them to release the first-ever estimates of annual direct bird mortality from human-related sources. 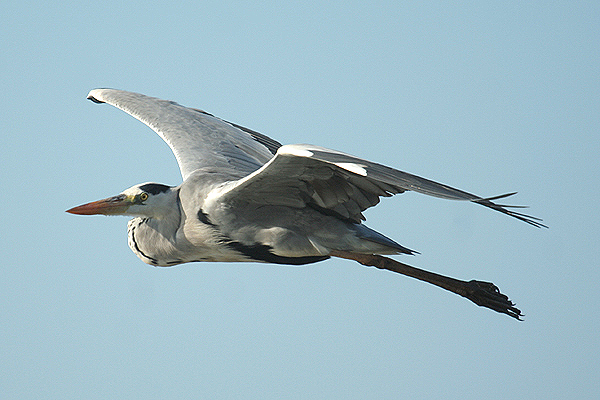 The results have just been published in a special issue of Avian Conservation and Ecology. Cats appear to kill as many birds as all other sources combined. Feral and pet cats are believed to kill more than 100 million birds per year in Canada. 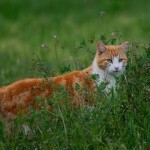 An estimated 60% of those are killed by feral cats. Bird species that nest or feed on or near the ground are especially vulnerable to cat predation. Collisions with electricity transmission and distribution lines have been identified as the second-largest human-caused source of bird mortality in Canada. Between 10-41 million birds per year are killed by collisions with transmission lines; between 160,000 and 800,000 birds are electrocuted by distribution lines; and about 400,000 nests are destroyed annually due to vegetation clearing under powerlines. Collisions with residential and commercial buildings are the third-highest of the human-related sectors, killing an estimated 16-42 million birds each year – mostly at houses. Following bird-friendly building guidelines can help individuals and building managers reduce the risk to birds. Using commercial products, special glass, or homemade solutions to make windows more visible to birds can reduce daytime collisions. Night-time window collisions can be reduced by leaving lights off in low-rise and high-rise buildings. An estimated 13.8 million birds are killed annually by colliding with vehicles on Canada’s primary and secondary roads. There are about 10 billion birds in Canada. The estimated total of 269 million bird deaths per year caused by human-related factors constitutes less than 5% of the overall population. Bird deaths from other causes (such as natural predation, disease, severe weather, or habitat loss) are not reflected in the estimates. Whilst Canada is undoubtedly a very large country we can still see that the Channel Islands will contribute annually to the global, and un-estimated, man-made, and avoidable, toll of wild birds. We are increasingly beginning to realise how important our islands are too for migratory birds just passing through. How many each year fail to reach their destination through some man-made structure in their path that they don’t see? Or from the house cats and feral cats that are found everywhere in Jersey except on our offshore reefs – and even there birds aren’t safe from man-made problems! And, when thinking of feral cats, is it any wonder why we have so few lizards in some places!